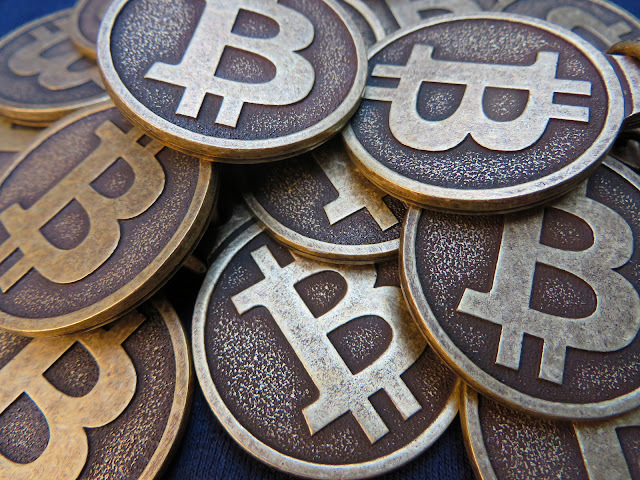 Bitcoin is proving that it's not only for techies. The growth in value of the digital currency known as bitcoin over the last year has caught the eye of investors as well. The value of one bitcoin was about $1 in 2011 until it reached its first "bubble" in July at $31 then dropped down. It got to $100 in 2013, and upon finding its footing, it rose to an astounding value of $1,000 in November of that year. After briefly hitting $1,000 again in 2014, it dropped down and found itself as low as $200 in 2015. The price of bitcoin reached around $600 in 2016. That's a significant return over the last year and when that happens, investors of all types take note. In 2017, bitcoin prices skyrocketed. But the roller coaster ride of bitcoin is not for every investor. It's traded on exchanges throughout the world and that makes it a liquid investment, but obviously, there's a significant level of risk. We've written in the past about how evaluating bitcoin as an investment requires that investors consider it as an "alternative investment" and thus should only utilize a small portion of their portfolios for this asset. Because of bitcoin's lack of correlation to other assets like stocks or bonds, placing a small percentage into these “non-correlated” assets can allow a portfolio to better weather a storm created by market volatility. In this way, these assets and their consideration as an “alternative investment” actually create less overall risk for a portfolio and the use of these investments have come to play a role in prudent portfolio asset allocation. The use of these alternative investments for investors' portfolio has been rising since the financial crisis of 2008. Many large wealth management firms such as Morgan Stanley and Merrill Lynch recommend prudent asset allocation models of 10 to 20 percent of an overall portfolio into alternative investments such as gold, real estate or hedge funds. As of yet, they're not recommending bitcoin and blockchain assets into this mix, but that's not stopping some investors from taking the leap with small portions of their portfolios. If you're not familiar with bitcoin, I'll give you the quick history of the asset. Satoshi Nakamoto, an anonymous “entity” or individual, produced a white paper outlining a new currency called bitcoin in 2008. At the time, the white paper and Satoshi’s creation resonated primarily with those in the tech world or those who believed that the current monetary systems needed change. Satoshi’s ideas held relevance and potential to change things. Although there are now many who liken Satoshi’s declaration of bitcoin as being similar to Martin Luther’s theses (as an example of the times, Luther posted his to a door and Satoshi posted his on the internet), the appeal and interest in the digital currency was slow to take hold or gain interest at the time. The road to acceptance of bitcoin has been bumpy and is still not fully completed. However, we’ve moved far from the days of the famous pizza purchase of May 22, 2010. This is actually a day that is celebrated by many in the bitcoin world and it's known as Bitcoin Pizza Day. At that time, bitcoin was being used more as a barter instrument among those in the developing and programming world. Bitcoins were being created through computers that ran the program and these were used to pay other programmers for their work. When the technology was about a year old, Laszlo Hanyecz, a programmer, made the leap of paying a fellow user on an Internet forum 10,000 BTC for two Papa John’s pizzas. Considering that bitcoin had reached a high price of over $1,000 in November 2013, the value of those pizzas was over $10 million. Now that truly warrants its own holiday! The period between the pizza purchase in 2010 and the $1,000 high in 2013 was a time in which bitcoin became more widely used as a form of currency. This was primarily due to the ability to own bitcoin through an exchange rather than the previous manner of gaining them exclusively through mining for them. The first exchange that allowed for these bitcoin transactions was called Mt. Gox, which had originally begun as a site to sell and trade cards from "Magic The Gathering," thus the name of the exchange. We’re now at a time when bitcoin finds itself being written about in the mainstream press and the digital currency is traded on a 24-hour basis on exchanges around the world. You can buy computers, furniture, coffee and just about anything else with a digital currency that is not backed by gold and doesn’t exist in physical form. The creation and functioning of these exchanges are an important reason why bitcoin is not only gaining acceptance. People are using the digital currency as an investment vehicle as well. These exchanges and the awareness of value being created by digital currencies has led to the creation of other currencies, referred to as cryptocurrencies or blockchain assets. According to Crypto Currency Market Capitalizations, the total value of these blockchain assets was nearly $12 billion in August 2016. Although bitcoin constitutes nearly 80 percent of this valuation –it’s the only one worth over $1 billion, sitting at over $9 billion market value –the overall market covers nearly 700 digital currencies. On a 24-hour basis, there is nearly $80 million in volume among the various exchanges throughout the world. This market didn’t exist prior to 2008 and the creation of bitcoin. Actually, bitcoin was the only blockchain asset until 2011 when Litecoin and Namecoin were created. During that time, this creation of blockchain assets has funded new companies, developed new technologies and allowed people to both make and lose money trading them on worldwide exchanges. Another valued blockchain asset is Ethereum, which saw its value increase over 1000 percent only a few months after its creation. The rapid growth of interest in Ethereum actually led directly to the creation of other blockchain assets. One of these was something known as The DAO (distributed autonomous organization) and its premise was to hold Ether (the cryptocurrency for Ethereum) and to institute an organization that would decide what to do with this supply. Members of The DAO would vote for proposed projects and share the benefit from the success of these efforts. The DAO became the largest crowdfunded effort, receiving over $160 million of ETHER. This interest displayed that not only was there an appetite for investment in blockchain assets, but that the method of using blockchain assets for crowdfunding new businesses could be a wave of the future. The other blockchain asset that was directly created from Ethereum is known as Ethereum Classic. This new blockchain asset was created in reaction to the reality that soon after The DAO was created, it was hacked and over $50 million was taken. This essentially killed The DAO and the reaction of the Ethereum team was to implement what’s known as a hard fork to return the money to its investors. This led to the creation of Ethereum Classic. A young startup company named Lawnmower became noted as creating one of the "easiest ways to buy bitcoin" with its mobile app. The company has expanded to provide information, education and analyst reports on the various cryptocurrencies that can also be bought and sold on the exchanges. Alex Sunnarborg, CFO of the company, points out, "there are currently over 20 blockchain assets with a market capitalization of over $10 million, 10 with a market cap over $25 million, two over $1 billion and one (bitcoin) with a market capitalization of over $10 billion." Lawnmower recently prepared a roadmap detailing the major blockchain assets. Lawnmower is planning to expand their easy way to buy bitcoin to include many of these other blockchain assets as well. They've created one of the first indices for these markets to allow users and investors to track these assets and the overall market as well. They call it the Lawnmower Blockchain Index and it tracks those blockchain assets that have above a $50 million market capitalization. The volatility of the blockchain asset machine has forced them to add and remove a number of assets from the Index since it was first released. The immediate valuation of The DAO found it securely on the Index only to be removed a few weeks later after its hack and ultimate demise. Similarly, assets such as STEEM and Monero seemingly came from "out of the blue" to valuations that warranted their placement on the Index. Whether they or others stay on the Lawnmower Blockchain Index is still worth watching, but the Index is allowing investors and observers to follow the movements of this upcoming and volatile market. Because of the explosion of the blockchain asset market over the last several years, we now have a market that once didn’t exist that’s worth nearly $12 billion. New companies can become funded with over $160 million of a blockchain asset! Whether it's an appropriate investment for you and your portfolio is up to you and your financial advisor. You may find however that your financial advisor may not be knowledgeable or even aware of these assets and how you can invest in them. Until Lawnmower builds out its capabilities to make buying these other blockchain assets as easy as it is on their app to buy bitcoin, the reality is that it's not yet that easy to invest in blockchain assets besides Bitcoin. Can You Discuss This With Your Financial Advisor? An advisor or investor can buy an investment called GBTC from the over-the-counter market. This is an ETF-like investment that is a pure bitcoin investment. Its underlying value is 1/10 the value of bitcoin. It trades at a steep premium, however, which shows the appetite that investors have for this type of investment. The rise of this market will eventually warrant the need for all financial advisors, money managers, and financial professionals to become educated and knowledgeable about these assets so they can have appropriate discussions with their clients. Until then, risky investors may be willing to take the dive into blockchain assets, but should do so by educating themselves on these markets and assets. We're still in the early stages, and although profits can be made, an investor must tread lightly to find the right "alternative investment" for his or her portfolio. DISCLOSURE: The author is an advisor and investor at Lawnmower and does own GBTC and numerous blockchain assets such as bitcoin, ETHER, and others.